What happens to an employee when there is a cultural mismatch? When an employee leaves your company there are intangible costs associated to them exiting your workforce which many companies don’t recognize. From operations and procedures to contacts that they had which were never documented or transferred to their superiors or the new employee to morale within the workforce there are elements which organizations can’t tie KPI’s to easily. 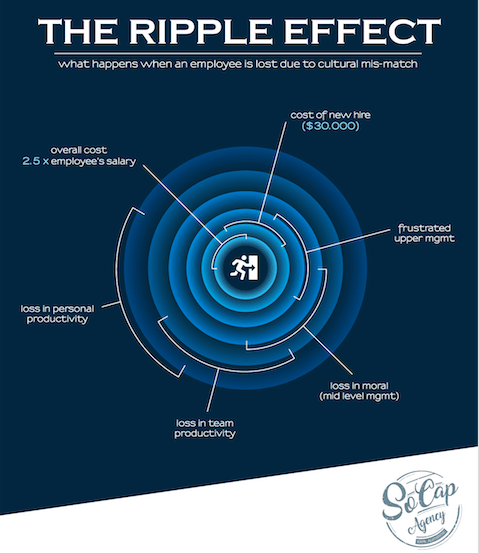 In this infographic we highlight what is the true ripple effect of losing an employee and the reverberations that your culture will feel echoing through the hallways. The hope is that you’ll see how a toxic culture will affect multiple layers of your organization and you can begin to understand the importance of creating a hyper-attractive culture.